Statement Necklaces - The Key Accessory! According to the weather forecast, spring unfortunately isn't just around the corner! So if like me, you are fairly tired of your winter wardrobe and are in need of some wearable trends to update your current look right now, then try out some of the fabulous statement necklaces and collars that are all over the High Street. These bold accessories are the easiest way to freshen up a plain sweater, shift dress or blouse and the best bit of all - they aren't weather dependant! Just layer over the neckline of your top, pop under the collar of your blouse, or layer a few different necklaces together - anything goes! 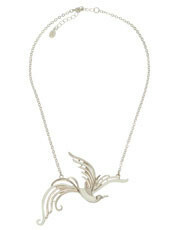 The white enamel makes this a great, fresh spring piece and it would look fab layered over a bright knit. 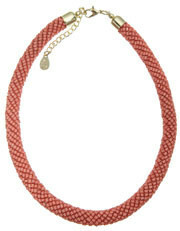 I love the coral colour of this statement necklace. It would be a great contrast layered over a black and white stripe or spot top - rocking both the 'monochrome' and 'pop of colour' trends all in one! The collar necklace is a key shape and gives you much more versatility than buying a peter pan collared top. I love the combination of pearls and diamantes in this piece - really pretty! This stunning necklace made with Swarovski elements (hence the price!) would glam up the plainest of outfits - comes with a matching bracelet too. Have you tried the statement necklace trend yet? What do you think of the High Street finds above? I'd love to hear your comments!